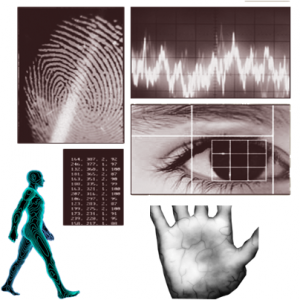 Different Biometric Modalities: Fingerprint, Speech, Iris, Gait and Vein. cation of persons. In 1892, the Argentineans developed an identification system when a woman was found guilty of a murder after the investigation police proved that the blood of the woman’s finger on the crime scene was hers. Nowadays one can find various types of biometric applications in real life. For example, The United Arab Emirates uses iris scans to identify foreign nationals, though the practice causes some to grumble. The government states that it uses the system to prevent criminals or people with expired visas from entering the country. Another example, at Ben-Gurion Airport in Tel Aviv, uses a dual-biometric recognition system that combines hand geometry and face recognition technology to create a redundant, convenient and highly accurate system for identifying and verifying the identity of tens of thousands passengers pass through each month. Despite of the advantages biometric system is not perfect. Variability of human biometric traits due to various factors such as wet finger in fingerprint recognition, lighting condition in face recognition, noisy background in voice recognition etc. makes biometric system error prone. fferent error rates for a comparator cannot be computed or theoretically recognized; it is only possible to achieve statistically estimates of the errors using test databases of biometric samples. erent kinds of comparison algorithms and dependent on the precision of the acquisition equipment and highly dependent on the precision of the machine representation of the biometric sample. ne the error rates used for creating the necessary output curves. cation processes, then we areworking with two types of important errors. erent persons to be the same person. A consequence would be that impostors wrongly are granted access. erent persons. A consequence would be that a genuine user wrongly is rejected access. Failure to Enroll (FE) failure to create and store an enrollment data record for an eligible biometric capture subject, in accordance with an enrolment policy. Failure To Enroll Rate (FTE) proportion of biometric enrolment transactions (that did not fail for non-biometric reasons), that resulted in a FE. Failure To Capture Rate (FTC) failure of the biometric capture process to produce a captured biometric sample that is acceptable for use. ff (DET) or Receiver Operating Characteristic (ROC) curves. This is illustrated in the Figure below. Examples of Decision Error Tradeoff (DET) and Receiver Operating Characteristic (ROC) curves. erent systems against each other, and briefly it gives an idea of how good a system it is. In Figure 3.11 (DET-curve) one can observe how it is possible to read the EER. Simply draw an angle of 45 degree line from the (x,y) = (0,0).